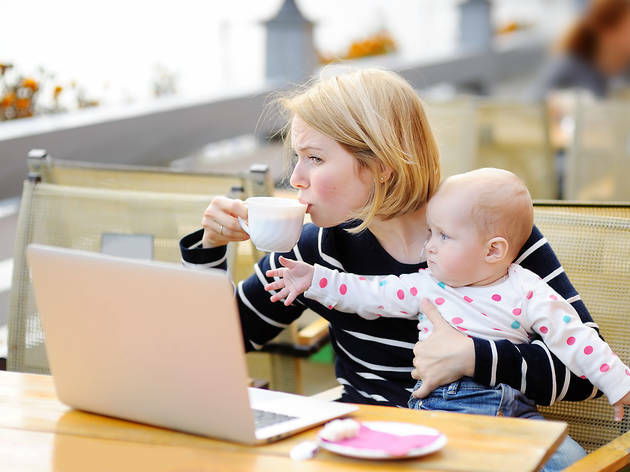 The buzzword “mindfulness” is gaining traction lately, but any form of meditation or self-care for busy moms can seem like a luxury. However, experts say the popular form of meditation is particularly beneficial for parents. Mindfulness generally entails focusing on a moment. It is practiced through exercises such as paying attention solely to one’s breathing, or to one specific sense, such as hearing or touching. “I once heard another teacher say, ‘listen for the sound of Om in your baby’s cry,” Sussell recalls. Believe it or not, you can even learn from those less-than-quiet moments as well. Sussell notes that all forms of meditation are easier to practice with the help of YouTube videos and a plethora of articles. Researching the topic can be a fun activity to do with older kids too, she adds: “Moms with older children can [use] resources like books,” she adds. Sussell personally enjoys Mindful Monkey, Happy Panda by Lauren Alderfer, audio recordings and family yoga classes. Need some "me time"? No sweat! Practice some mindfulness tips as your kids explore these indoor activities. Embrace those quiet and hectic moments when things get overwhelming on those family vacations. Even while you're doing something as simple as watching new Disney movies, you can practice mindfulness. Give it a whirl! By Heather Senison. Heather has been a journalism and editorial Swiss Army Knife, covering every topic imaginable, in New York state for more than a decade. She is also a mom, a musician and a horseback rider.